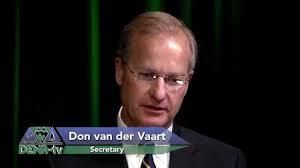 Donald van der Vaart is straight out of an Art Pope/Civitas/John Locke Foundation briefing book. He took over the Department of Environmental Quality (DEQ) last January from big business toady John Skvarla, who had bungled the response to the Duke Energy Dan River coal ash spill. Van der Vaart is twice as dangerous as Skvarla ever was because he's four times smarter and infinitely better educated. He holds multiple degrees in chemical engineering including a Ph.D. from Cambridge, plus a law degree. He has a wide mean streak. He's confrontational and is not afraid to use his educational attainments to intimidate lesser human beings. In other words, he's the type of take-no-prisoners, "you're fired!" Republican administrator currently in vogue among conservatives. A Donald Trump kind of guy. 1. He's a free market fundamentalist -- let the corporations rule! In other words, he's "economic" in his perspective in that he knows the cost of everything and the value of nothing. 2. He's following the Art Pope/Civitas playbook in sneering at "renewable" energy -- solar and wind power principally. He would enthusiastically applaud the elimination of North Carolina’s "renewables mandate" that was enacted in 2007 and which the Art Pope Machine has been trying to eliminate. 3. He loves loves LOVES fracking and is a big promoter of off-shore oil/gas drilling. 4. He has proposed a major policy change to the Environmental Management Commission to eliminate the air pollution permit process for rock quarries, concrete plants, and some 1,400 other small businesses in the state that account for 3.4 percent of air emissions. Terry Lansdell of Clean Air Carolina says the proposal will let "businesses police themselves rather than relying on state oversight." 5. In March, two months into his tenure at DEQ, he signed off on a settlement with Duke Energy over coal ash violations. The fine that Duke deigned to accept was $25 million, the largest in DEQ's history but still considered a mere mosquito bite for the multi-billion-dollar corp with a "bad neighbor" history. 6. He submitted a compliance plan for the federal Environmental Protection Agency's Clean Power plan that was "designed to be rejected," because he has a bigger fish to fry: he's part of a law suit against the EPA challenging the entire mandate for clean power. Being a prick to the Obama administration's EPA only wins him more hugs and kisses from fighting mad conservatives. 7. "Van der Vaart has said the only way to make drastic reductions in carbon emissions is by aggressive development of nuclear power."